Hast thou ever heard of Coconut Crabs? Imagine if you will, and this is entirely true, crabs which grow to the size of large cats…only cats with six legs, exoskeletons and shoe-sized claws. These crabs are revolting. Honest, go Google one now. Speaking of Acromegaley, that is the exact, rare deforming condition that the protagonist of Dark Horse’s brand new crime comic, Creep #0, suffers from. Written by Jon Arcudi, it really looks like a modern Phil Marlow comic, only with a guy who’s face and lifespan have been cursed by medical misfortune. I’m game. I’m also going to fork over some cash for that Grendel Omnibus vol. 1 they have out this week. Excellent stuff! So these crabs are so tough, and so ugly that they have been pushed out of most populated areas. Hideous, giant crabs need room. Hell, these guys are so abhorrent that no other organisms want to be in the same GENUS as them. Currently they are found in dark recesses of Indian Ocean islands, such as the Christmas Islands and remote part of Malaysia. NOW, Comics are often printed in Canada, China and parts beyond, and we never truly know where a crate of comics might be showing up from. For all we know, this week’s epilogue to the last Batman story in Batman #12 MIGHT be printed anyplace. Imagine Jeff’s surprise when he opened up a crate a few weeks back, and rather than discovering a batch of Horror DVDs and T-shirts there was a crate filled entirely with Coconut Crabs! GHA! AND THEY HAD KNIVES! 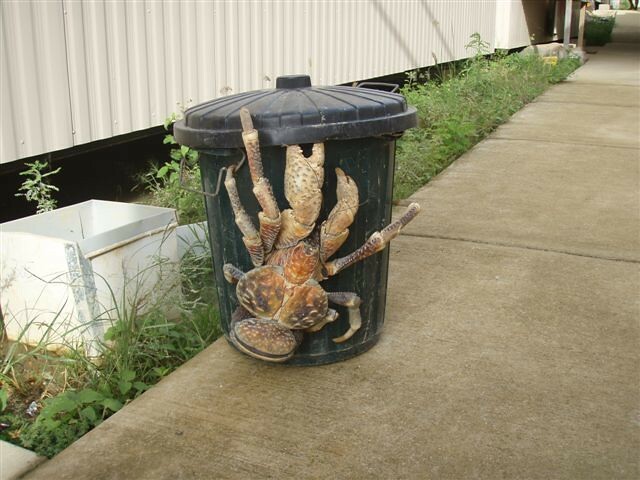 Did you know that Coconut Crabs are a Class 1 illegal species here in the United States? We didn’t either, but a crack team of New York supercops have been assembled to try and suppress this infestation with extreme prejudice. It seems that the crabs, if left unchecked, would easily topple the rats as the top “Bottom feeders.” It would only be a matter of time before they had tamed the pigeons and started using them as mounts to migrate across America. As we speak, the old Forbidden Planet is a battle-zone of bullets, claws and bazookas. It’s like Starship Troopers, only NPH is Bloomberg. So, this week, take a moment to explore our new HQ, and while you read the latest issue of Wolverine #311 (Where we discover why Sabertooth isn’t dead) you may rest assured that you will not be devoured by any gigantic, scuttling menaces from beyond the nightmares of Man. That, and the rents are cheaper here. Sorry to hear they’re killing them instead of bringing them to a zoo or somesuch. They really are quite magnificent.